Have you played casino games on your cell phone yet?! Mobile gambling is exploding just like online gambling did, and games developers at Slotland.com – recently named one of the best mobile gambling companies in the world -- say the Motorola Razr is one of the best mobile phones for mobile casino games. The mobile platform isn’t like the Internet. There are no standards and inconsistencies among mobile phone brands have slowed development. Nokia, Sony Ericsson, Motorola -- everyone develops their own solutions as they go along. That means mobile entertainment providers like Slotland.com have to design versions of every game for every different phone brand. If they could choose one phone as the standard, it would be the Motorola Razr. Despite the challenges of pioneering new technology, Slotland.com/mobile manages to add a new mobile slot machine every six weeks or so. Coincidently, that’s about as often as Slotland’s huge Progressive Jackpot is hit. Technical challenges may be slowing the pace to a run, but it seems that no technical difficulty will deter the increasingly popular mobile entertainment platform from being just as big a pop-cultural phenomenon as the Internet. Analysts predict big things for mobile gambling. It's just the scale of bigness they disagree on. Informa estimates the current mobile gambling market to be worth about $1.2 billion and predicts it to reach $7.6 billion by 2010. Mintel forecasts the business will grow to $3 billion in the U.S. alone by 2009. Juniper expects nearly $20 billion worldwide by then. Recognizing the company’s commitment to unique games and exemplary customer service, Slotland.com was recently named as one of five finalists in the inaugural ME Awards for mobile entertainment “Best Gambling Company” category. 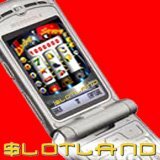 Mobile players can access Slotland.com slot machines from their mobile phone or PDA by logging on at wap.Slotland.com. Information about mobile gambling is online at www.Slotland.com/mobile. Players can make deposits and withdrawals from either their phone or computer.